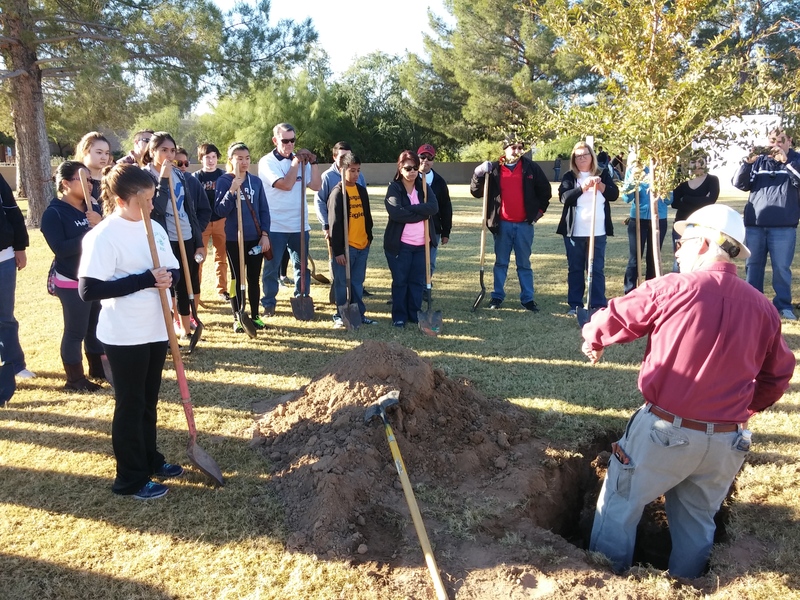 Last week we wrote about the VPA’s involvement with the City of Phoenix’s urban forestry goals and our participation in a tree planting event for the upcoming Super Bowl. We briefly touched on the benefits of trees but over the next several weeks we want to go more in depth about why planting trees is so important. First, let’s talk about the energy savings that trees provide since this is often a primary concern for customers of the Shade Tree Program. Planting trees can save the average household $100-$250 a year on utility bills. Three trees placed strategically around a home can reduce its energy consumption for cooling and heating by 25 percent and its summer air conditioning demands by as much as 50%! In Arizona where our highest utilities bills are often caused by running the air-conditioner, that is a substantial energy cost savings. Because cool air travels downward, standing under a tree, alone, can drop the temperature by 25°F. Imagine the energy savings from surrounding a home with several trees. Handy online tools like this one from Arbor Day help locate the best places to plant trees to optimize energy cost savings or online diagrams, like the one pictured right, illustrate how to determine where to place trees and other landscaping plants. Heating and cooling homes comprises about 60% of total residential electric usage in the US. Not only will you be saving hundreds of dollars in utility bills by planting trees, but you’ll be helping to reduce the amount of energy we all use. Along with cooling homes, trees can also cool a city nearly 10°F by providing shade, by breaking up the heat released from concrete, and by releasing water vapor into the air through their leaves. A 10°F drop in Arizona can be the difference between 100°F and 110°F and anyone who has lived here during the summer knows that’s a major difference. Imagine the energy saved from grocery stores that need to keep their food at colder temperatures or those department stores we walk into that are nice and cool when it’s over 100 degrees out. Urban heat is responsible for about 5-10% of total US electricity demand and 20% of smog in highly concentrated urban areas is due to air-conditioners. If we were to strategically plant trees to optimize their cooling effects, it is estimated that the total cooling energy savings in the US could be as high as $5 billion annually. Energy savings is only one of the benefits of planting trees. The next blog in this series will explore another reason why trees matter. This past month the VPA participated in a Super Bowl program to plant trees in Phoenix and the shade tree manager, Aimee Williamson, and VPA’s executive director, Jennifer Bonnet, appeared in this KJZZ article that discusses the City of Phoenix’s urban forestry goals to provide 25 percent shade coverage by 2030 and to educate the public about the many benefits of trees. The city’s forestry supervisor and VPA board member, Richard Adkins, says Phoenix is currently at 9-12% and that most the land is beyond the city’s control as it is private property. He points out the need, therefore, to educate landowners about the importance of planting trees—benefits such as energy cost savings, carbon sequestration, increases in property value, and overall community welfare. In the article Aimee explains that the VPA’s Shade Tree program is particularly aimed at residential single-family households, providing free trees for the city’s large section of private property as well as educating the community about tree care. The Shade Tree program specifically uses desert-adapted trees which require less water and work best in Arizona’s soil. During tree workshops, which is part of the process to receive free trees, our certified Arborists explain the ways to properly plant and care for the trees. *Pictured left is one of our Arborists showing volunteers how to plant a tree during a community event. The Shade Tree Program also works to educate the public about the importance of tree planting, whether it be a blog posting like the one we wrote on environmentalist Lester Brown and his efforts to increase awareness about the benefits of planting trees, or by participating in programs that teach children about tree planting such as Valley View Elementary School’s Barrios Bellas tree planting project (pictured right) or by doing a tree planting tutorial with Southwest Elementary School. Sometimes, though, we simply begin a conversation about the importance of trees by showing what they do—provide beautiful shade. As Jennifer Bonnet pointed out in the KJZZ article, trees provide a spot for community to happen. Because shade during a summer day in Phoenix is something we all value. Although we are still in the throes of winter’s fluctuating freezing temperatures and, therefore, not at the best time to prune your trees, we thought we’d get a heads up on preparing you for pruning once temperatures even out (and after the first year of tree growth). The type of tree should always be considered when pruning as this influences the method used to shape the tree and the tools needed. Trees native to climates with hardwood forests typically grow vertically as they compete for sunlight. Desert-adapted trees, however, compete for water so they tend to grow nearly as wide as they are tall, often developing branches that can extend to the ground. This growth pattern should be considered when pruning desert-adapted trees. The main purpose of pruning a tree is to encourage healthy growth and to enhance the natural form of the tree. Regular pruning can prevent damage during monsoons and proper tools and method will ensure that the tree heals quickly to prevent insect infestation and damage to the tree. Ideally the best type of pruning is periodic light thinning rather than infrequent, major pruning. The general rule to pruning desert-adapted trees is 80:20. No more than 20% of tree foliage (or the main canopy) should be removed at one time and 80% of the area pruned should be new growth on the outer third of the canopy. (Refer to the left diagram). Regular pruning will help you notice dead or diseased branches that need to be removed. It is generally better to frequently remove small branches than to occasionally remove large ones. Fortunately, most desert-adapted trees need minimal pruning if they are placed in areas where they have room to grow and will not obstruct walkways or other plants and trees. We recommend pruning your tree only after the first or second year of growth. If a tree is pruned too early or too much is removed, you run the risk of removing branches that are needed for photosynthesis for the tree and you could end up starving the tree. 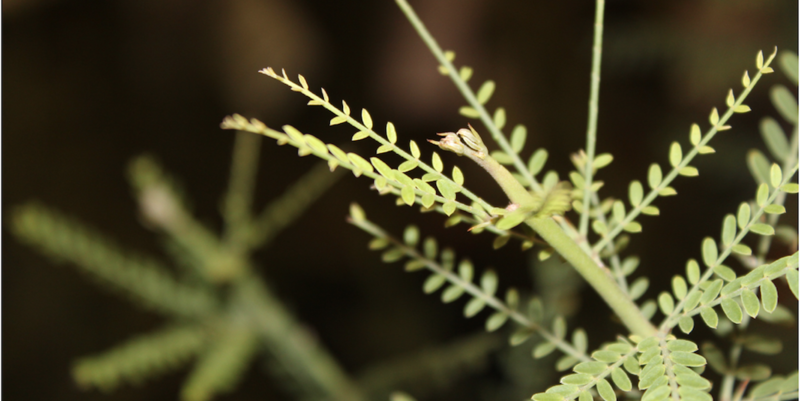 As much as 60% of all photosynthesis for the Blue Palo Verde happens on the surface of its young branches. As the tree grows, first remove branches that cross each other (rub against each other) or are starting to obstruct walkways or other plants. Also, remove any dead or diseased limbs. 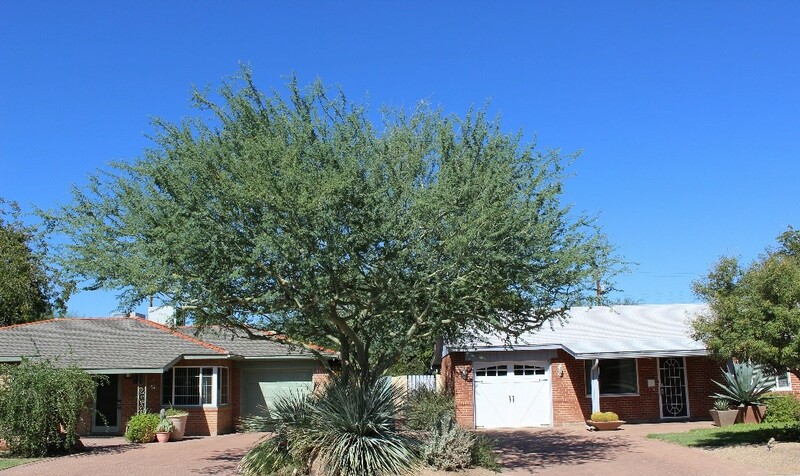 If you are pruning to influence the shape of your tree and are uncertain about how to trim it or what to remove, first seek the advice of a certified desert landscaper or an arborist. You can always post questions on our forum here and our Arborist will answer them. When pruning, use sharp tools for cleaner edge cuts that reduces the time needed for the tree to heal. Also use the correct size pruners or saw for the thickness of the branch being removed. 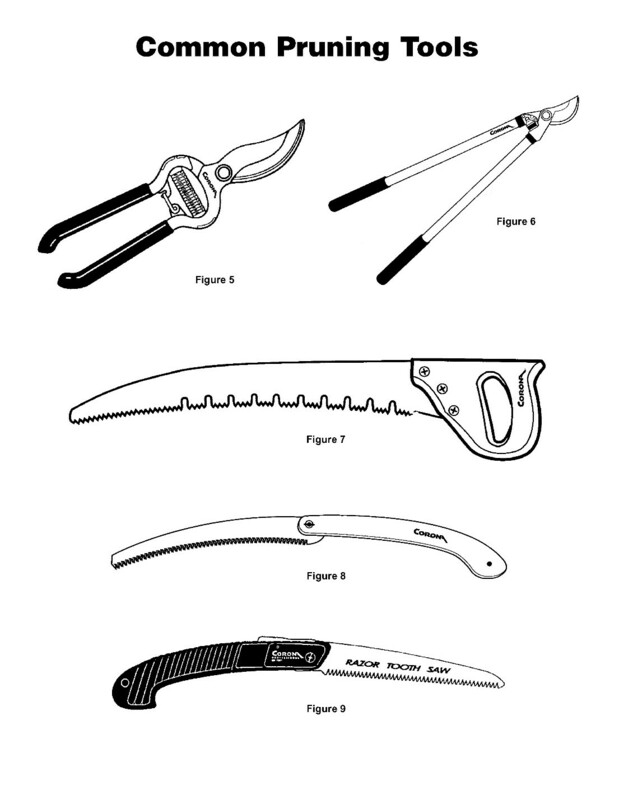 Refer to the drawing on the right for different types of pruning tools. The angle and position of pruning cuts will significantly affect the rate at which the tree will heal. Improper cuts will increase the chance of tissue dieback and insect infestation as it takes longer for the tree wound to close. 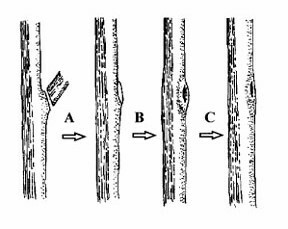 Cuts should be made near the branch bark ridge but not beyond it (refer to the diagrams below). Do not leave short stumps sticking out, a common mistake. 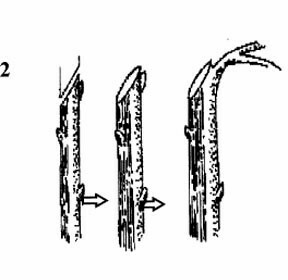 Prune directly above a bud or lateral branch at about a 45 degree angle (refer to diagram 2 below), as this will ensure correct and speedy growth of the cut branch and healing of the tree wound. If you are pruning a tree with thorns make sure to wear protective gear like eyewear, long sleeves, and sturdy leather gloves. Also use long handled pruners not only make the cuts but to pull the cut branches out and away from the tree. Remember, when it comes to pruning if you are in doubt about how or what to prune, wait. You can always remove later but can never add back. Below are some useful references for additional information, diagrams, and tips. If you have questions about pruning, please post them on our Ask the Arborist forum here and our volunteer Arborist, Erik, will answer them. Yes, freezing temperatures actually happen in Phoenix. Temperatures below 32 degrees for a prolonged time or over several nights can freeze tree buds/blossoms, fruit, leaves, and twigs. While the trees in our Shade Tree Program are desert-adapted and can, therefore, typically withstand freezing temperatures, young saplings can be vulnerable to the cold weather especially if they haven’t gone into winter dormancy and are, therefore, still actively growing. 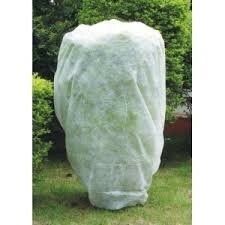 The best protection is to cover your trees with a sheet, light blanket, or burlap sack. Hardware stores sell sheets made of light, porous material specifically for frost protection but feel free to use whatever you have on hand except for anything made of plastic. Plastic traps moisture in and can damage the tree (the captured moisture can turn to frost). Also, thick blankets or covers can soak up moisture, become heavy, and press down on the tree. Ideally, you want the cover to touch the ground to retain the warmth under the cloth and around the tree (refer to the left picture and the diagram below). Although it’s recommended to not have the cover touch the leaves or branches, if you’ve ever covered a tree or plant you know that’s quite a task so just do the best you can. Remove the cover later in the morning when there is full sunlight and preferably when temperatures are warmer. Some of the coldest temperature occur at daybreak so if you can, wait a bit. Do not leave trees covered all day as this can damage them. If your tree gets frost bitten, do NOT trim the damaged parts as they still provide protection for the remaining living parts of the tree. Wait until the spring or when you regularly prune your tree. Make sure to water your trees regularly during winter. Dehydrated trees are more susceptible to frost-- frost damage occurs when ice crystals form on the leaf surface drawing moisture from the leaf tissue so if a tree is already dehydrated, the additional dehydration damages or kills it. Wet soil also absorbs heat during the day so water your plants in the morning and do not overwater. Refer to our blog on How to Properly Water Your Trees. 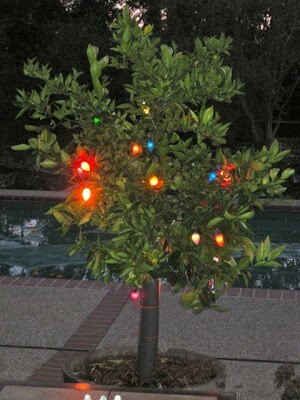 For large trees or frost-sensitive ones such as citrus trees, string 100-watt electric outdoor light bulbs, such as Christmas lights (pictured right). Not only are you decorating for the holidays but you are warming your trees. Make sure the lights are not too close to the trunk or branch that it could burn it. Place mulch around deciduous trees (like our Shade Trees) to prevent them from breaking winter dormancy by insulating them against fluctuating surface soil temperatures. However, do not place mulch around citrus trees, as it will hinder the capturing of heat that will protect the plant. Below are some great references for additional information and ideas. As always, if you have additional tips or questions, please post them on our Ask the Arborist forum here and our volunteer Arborist, Erik, will answer them. This week we end our blogs series on Shade Tree Types with our final tree--the Native Mesquite. The Native Mesquite is popular with people who want a tree that can grow to be quite large and aren’t concerned about thorns. A local Native Mesquite pictured left shows the giant canopy of a full-grown tree. Mesquites can grow up to 30 ft tall and wide and are known for their strong root systems that help support them during strong winds and storms. They are semi-deciduous so the trees lose some of their leaves during the winter. By mid-spring, the trees bloom into cream colored, cylindrical flowers and tan seed pods are shed in summer. A fun fact about Native Mesquites is that their pods can be ground into flour and used in many recipes. Refer to our blog on All About Mesquite for mesquite flour recipes and to learn about the other uses of mesquite pods and how to harvest them yourself! 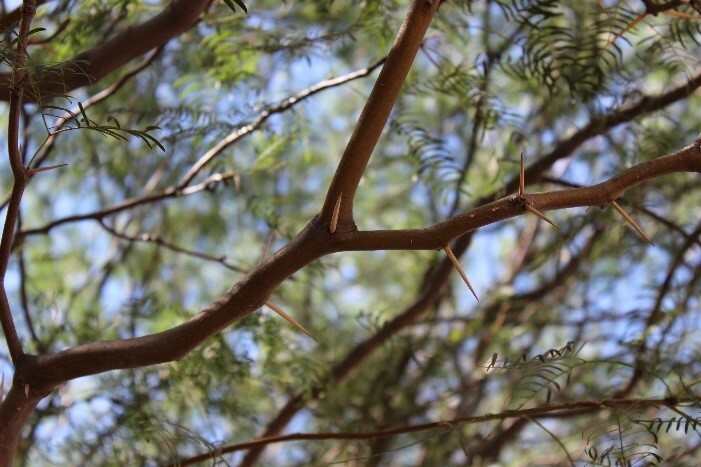 One important thing to note about the Native Mesquite is that the thorns can be quite large and sharp, as pictured right, so if this is a concern you might want to consider the Thornless Hybrid Mesquite. 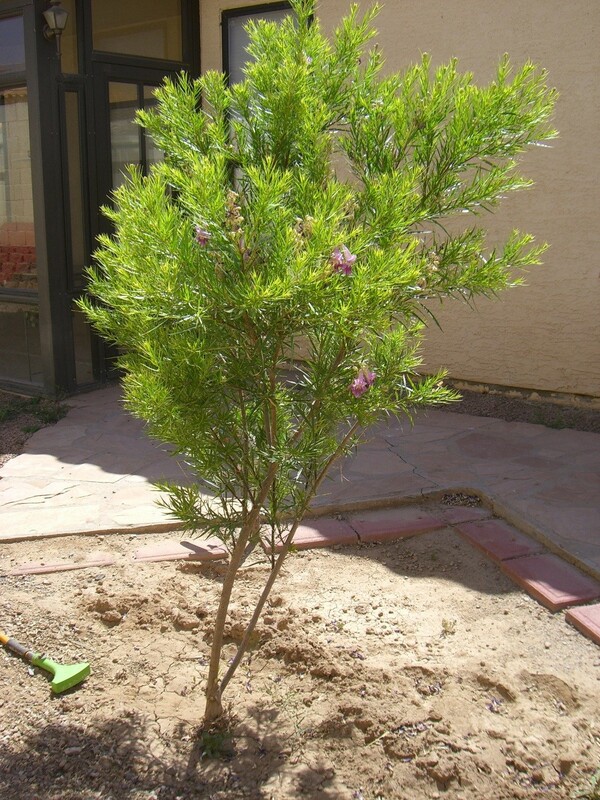 The Native Mesquite sapling you will receive comes in a 5-gallon base and tends to be 3-6 feet tall (pictured below). Plant your sapling in an area that receives full sun and during the first year, make sure to water the tree deeply, to 2-3 feet deep and away from the trunk to encourage the growth of a strong root system. The Native Mesquite has a natural deep root system that can grow over 100 feet laterally in order to find water, and the first 2-3 years are the most important in establishing this root system. During the spring and fall/winter, water it once every 14 days or less if there is rainfall, but during the hottest summer months increase the watering to once every week. Refer to our blog on How to Properly Water Your Trees for more information on watering techniques. After the first year of growth, periodic thinning is the best way to prune your tree. Remove no more than 20% of the canopy during the growing season in order to encourage root development that is proportional to the shoot growth of young trees. 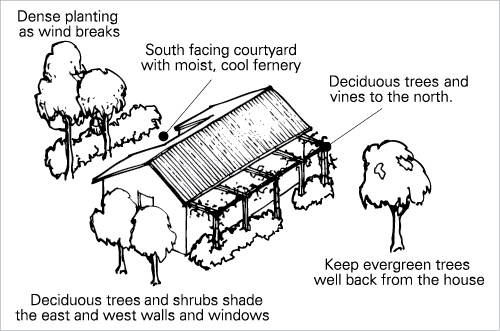 In areas with heavy monsoons, it is important to prune before the beginning of the storm season. Additional pruning, 3 to 4 weeks later, will reduce the risk of wind-throw and branch damage. Pruning more than 20% of the canopy can impede rooting and encourage undesired re-growth of dense, top-heavy clusters of branches and leaves. Native Mesquites are fast-growing, hardy trees and widely used in desert landscaping. While the pods are edible it should also be noted that a full-grown tree can potentially shed quite a bit of them so make sure and keep this in mind when you are deciding where to plant your tree. And remember they have thorns! 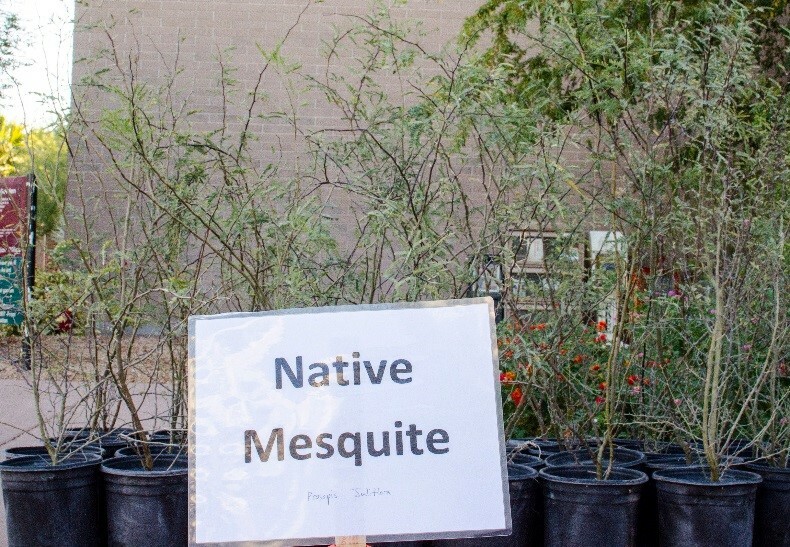 If you have a Native Mesquite or are thinking of getting one and have questions, please post them on our Ask the Arborist forum here and our volunteer Arborist, Erik, will answer them. 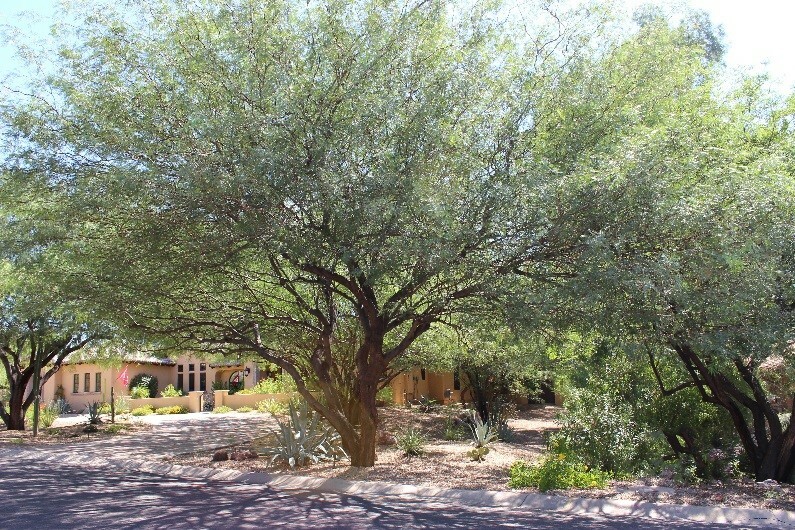 Our blog series on Shade Tree Types is going to end with the Mesquite varieties we offer. 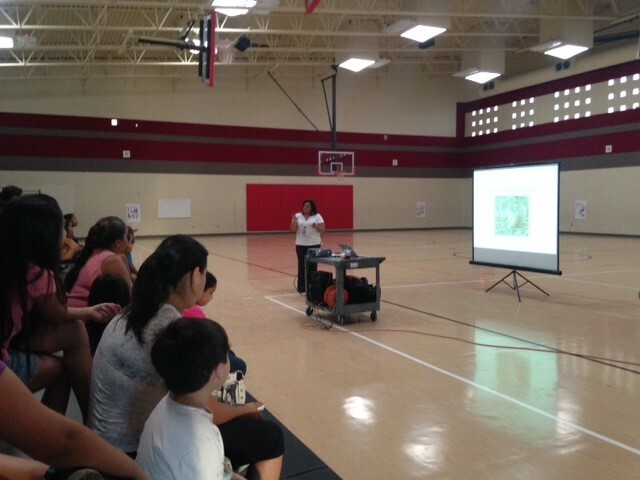 First we describe the Thornless Hybrid Mesquite. The Thornless Hybrid Mesquite (THM) is another favorite of people because the tree grows quickly, has a wide, lush green canopy that provides great shade, and the tree does not have thorns. The THM can grow up to 30 ft tall and wide and is know for its strong root system that helps support it during strong winds and storms. It is semi-deciduous so it loses some of its leaves during the winter. In late spring, THMs produce clusters of yellow-green flowers and in summer, the tree starts to shed its brown seed pods. THMs can be found throughout the valley. Pictured left is one located near our downtown Phoenix office. You can see the full shade it provides for the front of the house as well as the driveway and how it adds immensely to the surrounding landscape. The THM sapling you will receive comes in a 5-gallon base and tends to be 3-6 feet tall (pictured right). Plant your sapling in an area that receives full sun and during the first year, make sure to water the tree deeply, to 2-3 feet deep and away from the trunk to encourage the growth of strong roots. The THM has a natural deep root system that can grow over 100 feet laterally in order to find water, and the first 2-3 years are the most important in establishing this root system. During the spring and fall/winter, water it once every 14 days or less if there is rainfall, but during the hottest summer months increase the watering to once every week. Refer to our blog on How to Properly Water Your Tree for more information on watering techniques. After the first year of growth, prune the tree to remove about 20% of the canopy during the growing season in order to encourage root development that is proportional to the shoot growth of young trees. In areas with heavy monsoons, it is important to prune before the beginning of the storm season. Additional pruning, 3 to 4 weeks later, will lessen the risk of wind-throw and branch damage. Pruning more than 20% of the canopy can inhibit rooting and encourage undesired re-growth of dense, top-heavy clusters of branches and leaves. While we typically don’t encourage staking, THM can become top heavy and may need to be staked for a brief period (no more than the first year). Please refer to our blog on How to Properly Stake a Tree for guidance. THMs are fast-growing, hardy trees and widely used in desert landscaping. The thornless feature is also kid-friendly. It should be noted that a full-grown tree can potentially shed quite a bit of pods so make sure and keep this in mind when you are deciding where to plant your tree. If you have a Thornless Hybrid Mesquite or are thinking of getting one and have questions, please post them on our Ask the Arborist forum here and our volunteer Arborist, Erik, will answer them. 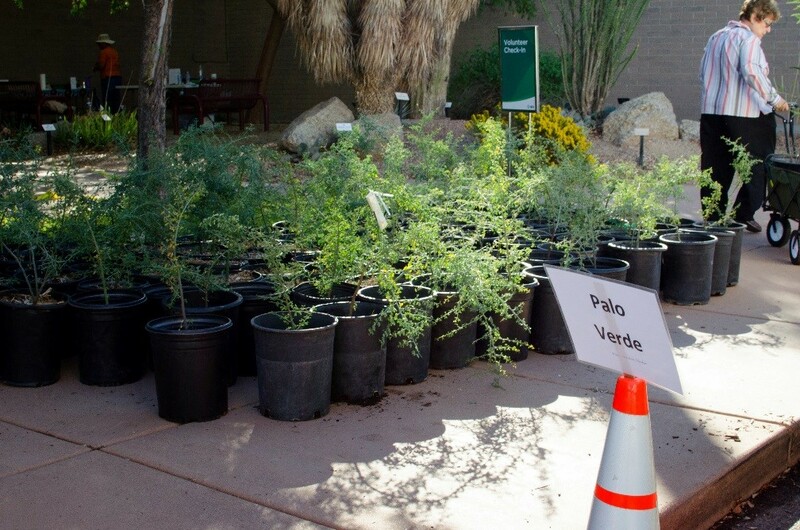 This week we feature the second Palo Verde given away through the Shade Tree Program--the Blue Palo Verde. The Blue Palo Verde (BPV) is Arizona’s state tree and one of the most colorful desert trees when in full bloom. The Arizona native tree grows quickly, reaching as high and wide (its canopy) as 30-35 feet. A local BPV near our downtown Phoenix office (pictured left) shows the ample shade it provides for driveways. Anyone who has had their car paint fade from the strong Arizona sun or been unable to touch the hot steering wheel can appreciate this. 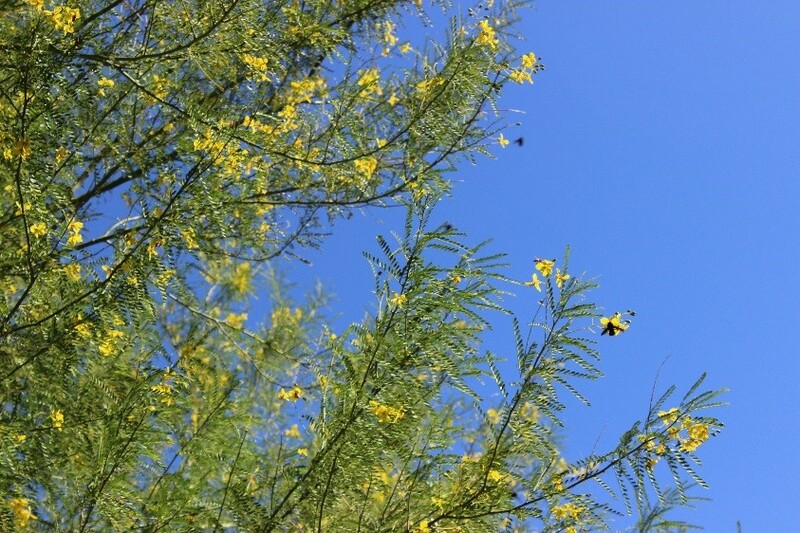 The bark of a BPV is a striking bluish green and the beautiful yellow blooms (pictured right) announce the arrival of spring in Arizona and attract beneficial pollinators such as bees and hummingbirds. The tree is highly adapted to desert conditions, withstanding extreme desert heat and cold hardy to 10 to 15 degrees. T he BPV sapling you will receive comes in a 5-gallon base and tends to be 3-6 feet tall (pictured left). Plant your sapling in an area that receives full sun and during the first year, make sure to water the tree deeply, at least to 3 feet. Water away from the trunk to encourage the growth of roots that have to search for water. During the spring and fall/winter, water it once every 14 days but during the summer increase the watering to once every week. Refer to our blog on How to Properly Water Your Tree for more information on watering techniques. After the first year of growth, prune the tree to reinforce the shape you want since BPVs can initially grow as large scrubs. As with the Thornless Palo Verde, do not remove more than 30% of the tree’s canopy during the summer as this can cause “sunburn” injuries on the tree which can later be infested with wood boring insects. Any insect infestation can inhibit the fast seasonal growth of young trees so inspect your tree and if you see any insects such as aphids, thrip, whiteflies, or psyllids, apply a non-harsh control measure such as those listed in our blog on aphids and organic insect control here. BPVs are truly beautiful trees but an important reminder is that these trees can shed quite a bit. If placed in front of a house, the blooms blanket a barren ground with golden blooms and look quite stunning. But if a BPV is placed near a pool, the shedding can become quite the headache. Also, these tree do have THORNS so if kids climbing trees is an issue, you might want to consider the Thornless Palo Verde. If you have a BPV or are thinking of getting one and have questions, please post them on our Ask the Arborist forum here and our volunteer Arborist, Erik, will answer them. 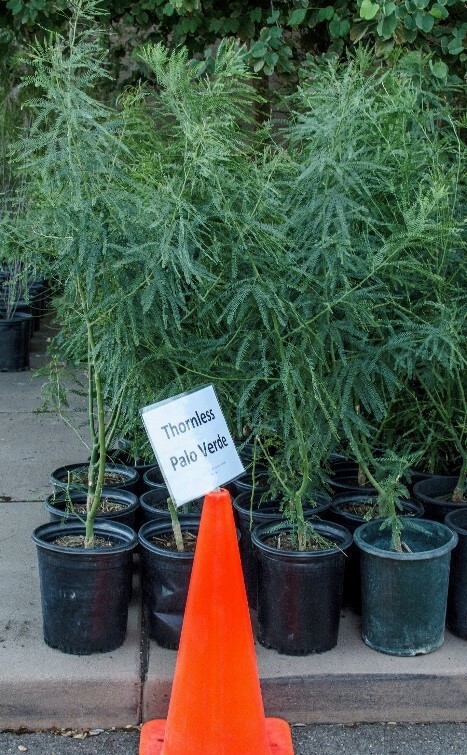 This week we are focusing on one of the two Palo Verde varieties offered through the Shade Tree Program--the Thornless Palo Verde. The Thornless Palo Verde (TPV) is a hybrid with similar characteristic founds in Palo Brea, Blue, and Mexican Palo Verdes. The semi-evergreen TPV grows a large canopy that provides ample shade, a lush green trunk, and elaborate branching patterns that remain smooth as they mature. 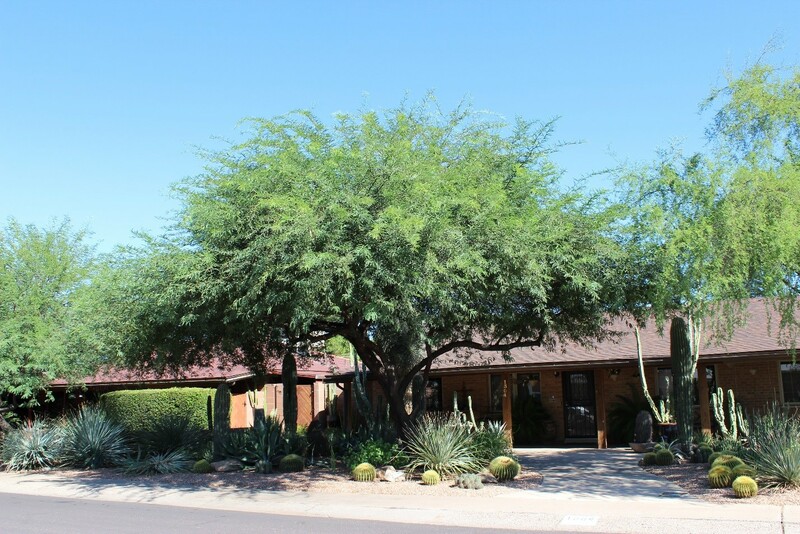 Pictured left is a local TPV near our downtown Phoenix office--notice the large amount of shade the tree provides against the front of the house. The TPV grows slightly smaller than other varieties but still reaches up to 25 ft tall. During spring and summer months, TPVs bloom into small yellow flowers. In addition to providing beautiful blooms, the flowers attract beneficial pollinators such as bees and hummingbirds like those in the picture on the right, also taken from a home in the local area. The TPV sapling you will receive comes in a 5-gallon base and tends to be 3-6 feet tall (pictured left). Please note that young TPVs may have thorns that fall off as the tree grows. Plant your sapling in a spot that will receive full sun. During the first year, make sure to water the tree deeply, at least to 3 feet, and away from the trunk to encourage the growth of roots that have to search for water. During the spring and fall/winter, water it once every 14 days but during the summer increase the watering to once every week. Refer to our blog on How to Properly Water Your Tree for more information on watering techniques. After the first year, perform periodic trimming as needed but do not remove more than 30% of the tree’s canopy during the summer as this can cause “sunburn” injuries on the tree which can later be infested with wood boring insects. Any insect infestation can inhibit the fast seasonal growth of young trees so inspect your tree and if you see any insects such as aphids, thrip, whiteflies, or psyllids, apply a non-harsh control measure such as those listed in our blog on aphids and organic insect control here. Thornless Palo Verdes are great trees for those who love the yellow blooms of Palo Verdes but could do without the thorns or have kids that climb trees. The tree does shed its yellow blooms so the litter should be a factor when considering this tree. The litter, however, is less with the hybrid since there are fewer blooms. Once fully-grown, the TPV provides substantial shade especially for houses that have low-placed windows or open areas. If you have a TPV or are thinking of getting one and have questions, please post them on our Ask the Arborist forum here and our volunteer Arborist, Erik, will answer them. 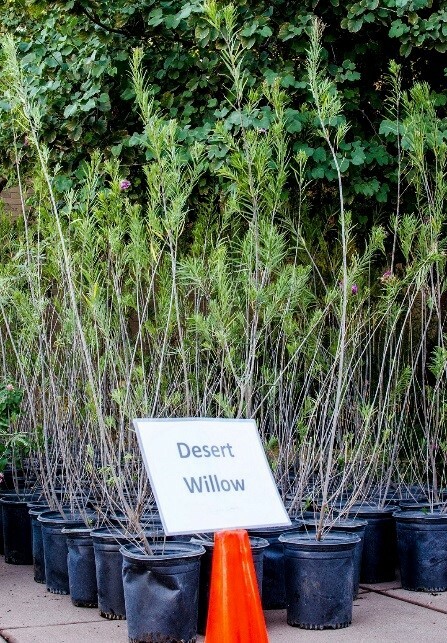 Following last week’s blog on the Desert Willow, we thought we’d introduce the other willow offered through the Shade Tree Program--the Willow Acacia. Native to Australia, the Willow Acacia is low maintenance, thornless, and fast growing with most mature trees reaching up to 40 ft high and 20 ft wide (pictured left). The canopy doesn’t grow as wide/rounded due to the narrow leaves nor as low as other trees so they are, therefore, good in narrower spaces. Willow Acacias are evergreen, meaning they keep their green leaves year round, and during late summer to fall the trees bloom into creamy white puffball flowers (pictured right) followed by woody bean-like pods. 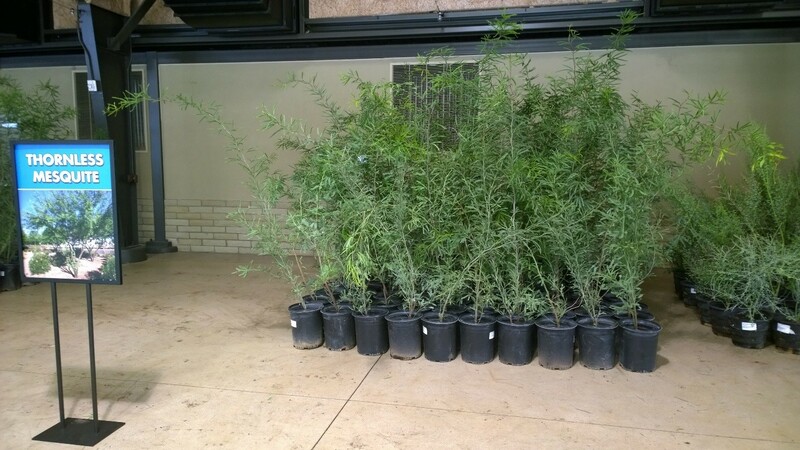 The Willow Acacia sapling you will receive comes in a 5-gallon base and tends to be 3-6 ft tall (pictured below). Plant your sapling in a spot that will receive the full sun. During the first year, make sure to water deeply (at least 3 ft) and away from the trunk to avoid blow over during windstorms. Deep, infrequent watering helps to develop a strong, anchoring root system. Once the tree has become well-rooted, water it sparingly--every three to four weeks in the summer and every other month in the winter. Refer to our blog on How to Properly Water Your Tree for more information on watering techniques. Because Willow Acacias grow quickly and can develop thick canopies, thinning the canopy helps to reduce wind resistance, especially during our monsoon season. After the first year, prune your Willow Acacia in fall or early spring to raise and thin the canopy and to remove dead or damaged limbs. Also, although we typically discourage staking because we prefer trees to develop a strong root system on their own, sometimes Willow Acacias will benefit from staking when young, as they can grow quickly and top-heavy. Please refer to our blog on How to Properly Stake Your Tree. Willow Acacias might be a good choice for people who have less room to work with and want a low-maintenance, low-litter and fast growing tree. If you have a Willow Acacia or are thinking of getting one and have questions, please post them on our Ask the Arborist forum here and our volunteer Arborist, Erik, will answer them. Over the next six weeks we are introducing the types of free trees available through the Shade Tree Program by providing some background information and care requirements, in order to help you decide which trees you want for your home and to learn more about desert-adapted trees. This week we are starting off with the Desert Willow, as this is one of the more popular trees because of the beautiful pink and purple flower blooms (pictured below). Desert Willows are native to the U.S. southwest and northern Mexico. Their native name, mimbre, means willow-like. 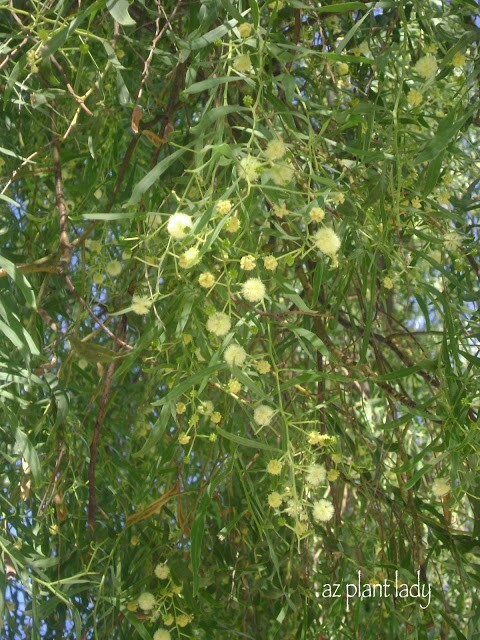 Desert Willows aren’t, in fact, true willows as they below to a family of blooming plants. 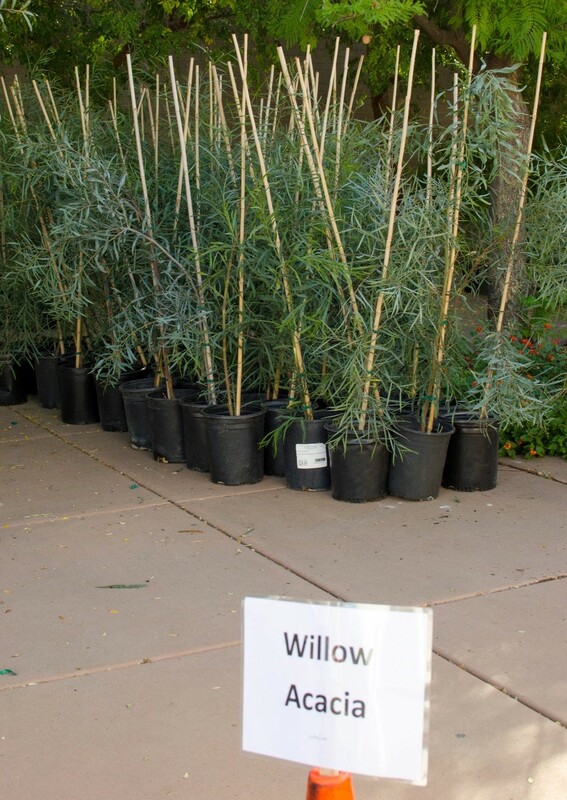 Desert Willows are drought-tolerant and fast-growing, with some reaching heights as tall as 25 feet. They can be grown as a multi-stemmed shrub or pruned as a tree. From spring to summer, the Desert Willow blooms into white, purple, and pale pink trumpet-shaped flowers. By early fall, the flowers are replaced by long, thin seedpods (pictured below). Medicinal teas can be made from the dried flowers, leaves and bark that help regulate glucose metabolism and sooth coughs. The wood has often been used for fence posts, houses, and thatch roofs. From late November to March, the tree drops its leaves and often customers contact us because the tree appears dead. This behavior is completely normal as part of the dormancy process our desert-adapted trees undergo during the fall and winter (refer to our blog on Tree Dormancy for more information). 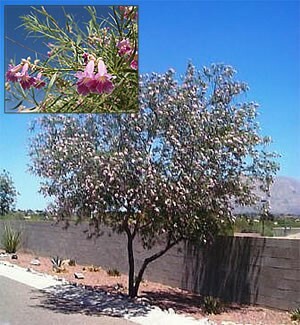 The Desert Willow sapling you will receive comes in a 5-gallon base and tends to be 3-6 feet tall (pictured right). Plant your sapling in a spot that will receive full sun or partial shade. During the first year, make sure to water the tree deeply--down to at least 3 feet. During spring and fall/winter, water it once approximately every 14 days but during the summer increase the watering to once every week. Refer to our blog on How to Properly Water Your Tree for more information on watering techniques. After the first year, prune the tree in spring just as leaves being to grow to remove any winter damage and to shape it. Below is a picture of one of our customer’s Desert Willow almost a year after receiving it from a workshop. She had recently pruned it into the tree shape she wanted. If you choose the Desert Willow as one (or both) of the free Shade Trees for your home, you will enjoy the beautiful blooms and although the tree does shed its blooms and pods, it is moderate compared to other desert-adapted trees. 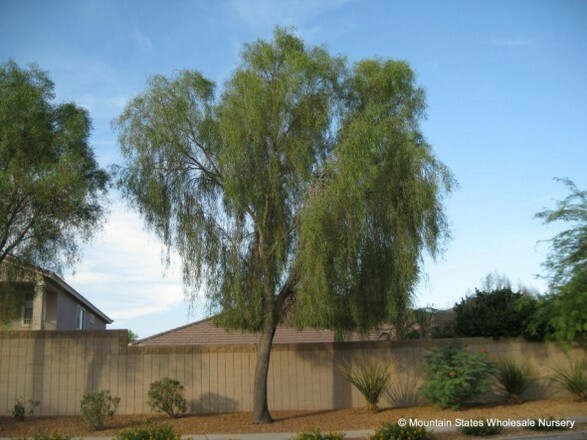 Also, Desert Willows tend to be resistant to pests and disease. 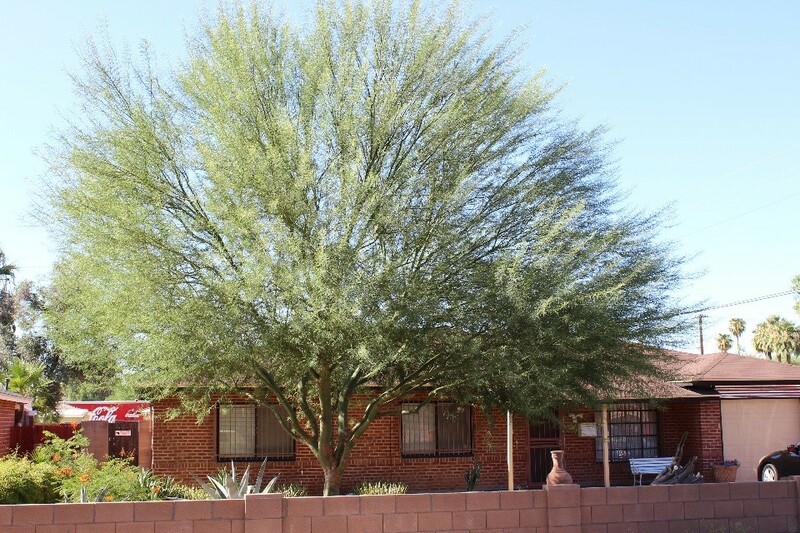 The main drawback with the tree is that it may not grow as tall and wide (its canopy) as our other trees, such as the Mesquite or Willow Acacia. If you have a Desert Willow or are thinking of getting one and have questions, please post them on our Ask the Arborist forum here and our volunteer Arborist, Erik, will answer them.